BILL EPPRIDGE AND ALYSSA ADAMS TO APPEAR ON "MORNING JOE"
Renowned photographer Bill Eppridge will join Alyssa Adams, wife of the late Eddie Adams, on the MSNBC program "Morning Joe" on a date to be announced shortly.. They will be discussing the new book, "Eddie Adams: Vietnam", authored by Alyssa Adams and containg astonishing never-before–seen pictures, articles, pages from journals, and other of Eddie Adams' artifacts. Bill Eppridge's assignments were as varied, exhilarating and tumultuous as the times themselves. With well over 100 assignments, Eppridge had already proved his talent by the time he was formally made a member of the exalted Life Magazine staff in 1964. He was assigned to cover the New York airport greeting of The Beatles, amidst the hustle and bustle of the working press. He was determined to occupy the perfect camera angle, and found another photographer looking for the same vantage point: Eddie Adams, on assignment for the Associated Press. It was Bill and Eddie's first meeting, and the beginning of a life-long friendship. Their paths crossed again in Vietnam. 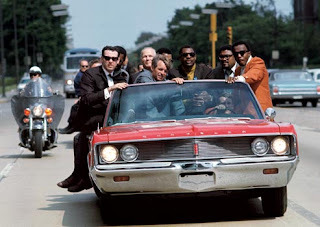 Eppridge returned to America to cover Robert Kennedy's 1966 campaign for Senate, and his 1968 Presidential Campaign. Soon after Kennedy's victory speech at the Ambassador Hotel, he heard eight gunshots—“the sound I will never forget”—and snapped the grim final images of Kennedy, bleeding in the arms of a stunned busboy. Bill Eppridge is one of the most accomplished photojournalists of the Twentieth Century and has captured some of the most significant moments of that time: the civil rights movement, including the Neshoba murders in Mississippi; Woodstock; and assignments for National Geographic, People, and Sports Illustrated. 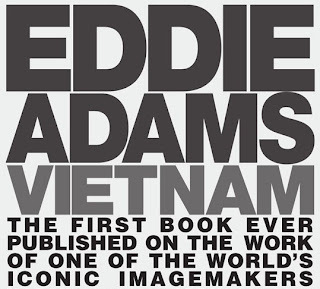 "Eddie Adams: Vietnam" is the first book by one of the world’s legendary photojournalists, Eddie Adams, is along-awaited landmark. Adams’1968 Pulitzer Prize-winning photograph cemented his reputation in the public eye and stands forever as an icon for the brutality of our last century: the image of Nguyen Ngoc Loan, police chief of Saigon, firing a bullet at the head of a Vietcong prisoner. Adam’s image fueled antiwar sentiment that ultimately changed the course of history. Monroe Gallery is honored to represent Bill Eppridge's and Eddie Adams' photography. Stay tuned to our blog for the announcement of the day and time of their appearance. Through astonishing never-before–seen pictures, articles written by Adams, pages from journals and other artifacts, one great journalist’s experience of the war is told in gripping detail. Edited by Alyssa Adams, with an essay by AP Bureau Chief Hal Buell, and contributions by Peter Arnett, Tom Brokaw, David Halberstam, George Esper, David Kennerly, and more, this is a classic of modern history and photography. Monroe Gallery of Photography is privilaged to represent the Eddie Adams Estate. 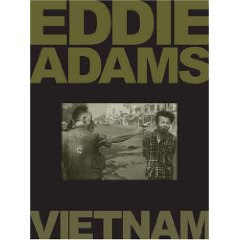 Eddie Adams: Vietnam is available from the gallery and most major booksellers. To view Eddie Adams' photography, please vist our website. 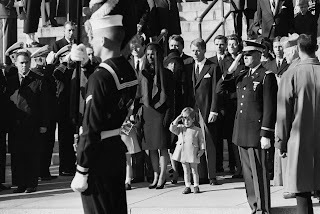 John F. Kennedy Jr. saluting his father's coffin, November 25, 1963, with Ted Kennedy, Jacqueline Kennedy, Rose Kennedy, Peter Lawford, and Robert F. Kennedy in background. On the cold November day that America buried its slain president in 1963, UPI photographer Stan Stearns was one of hundreds of journalists who watched Jacqueline Bouvier Kennedy and her two children emerge from Washington's St. Matthew's Cathedral veiled with sadness. As the first lady, Caroline and tiny John stood and watched John F. Kennedy's caisson about to pass by, Stearns poised his camera. Jackie bent down, whispered something into her son's ear, and 3 year-old John's right hand went up. And with a click, Stearns immortalized John's poignant salute to his young father in a photograph that would crystallize the nation's grief the next morning on the front pages of newspapers and magazines around the world. ...Stearns was a Washington photographer for United Press International when he made the picture that he said lost journalism's Pulitzer Prize by one vote. A Dallas photographer's shot of Jack Ruby shooting Lee Harvey Oswald took the prize that year. Monroe Gallery is privilaged to now represent Stan Stearn's photography. BILL EPPRIDGE HONORED AS "PHOTOGRAPHER OF THE YEAR"
The Photo Marketing Association International (PMA), an 83 year-old worldwide community of imaging associations representing 20,000 members in 100-plus countries has named Bill Eppridge as Photographer of the Year. Eppridge will be honored at their annual International covention this year in Las Vegas March 3 -5. Bill Eppridge is one of the most accomplished photojournalists of the Twentieth Century and has captured some of the most significant moments in American history. Over the last 35 years, his work has appeared in numerous publications, including National Geographic, Life, and Sports Illustrated. Eppridge spent much of 1966 and 1968 on the road with Robert F. Kennedy, covering the presidential campaign for LIFE magazine. It was Eppridge who took one of the decade’s most poignant and iconic photographs: a stunned Los Angeles busboy cradling the candidate in the kitchen of the Ambassador Hotel of just seconds after he was shot. Monroe Gallery of Photography is honored to represent the photography of Bill Eppridge. 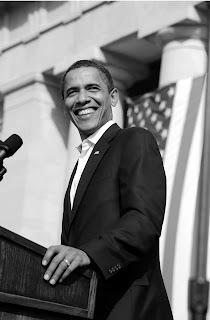 Monroe Gallery of Photography is honored to have Peter Turnley's photograph of the now-President Barrack Obama in the gallery collection. Peter Turnley is a renowned international photojournalist who has photographed most of the world's major news stories and important world figures and personalities in the past two decades.